If you’ve met our trainer and running guru, Gemma, you’ll know two things: 1) she loves to be outdoors and 2) she loves to run (like really loves to run and is absolutely amazing at it – we’re not jealous or anything). Alongside our Director and Head Trainer, Amanda Clement, these two powerhouses are the masterminds behind Momentum’s running programmes and you might often catch them running (no pun intended!) 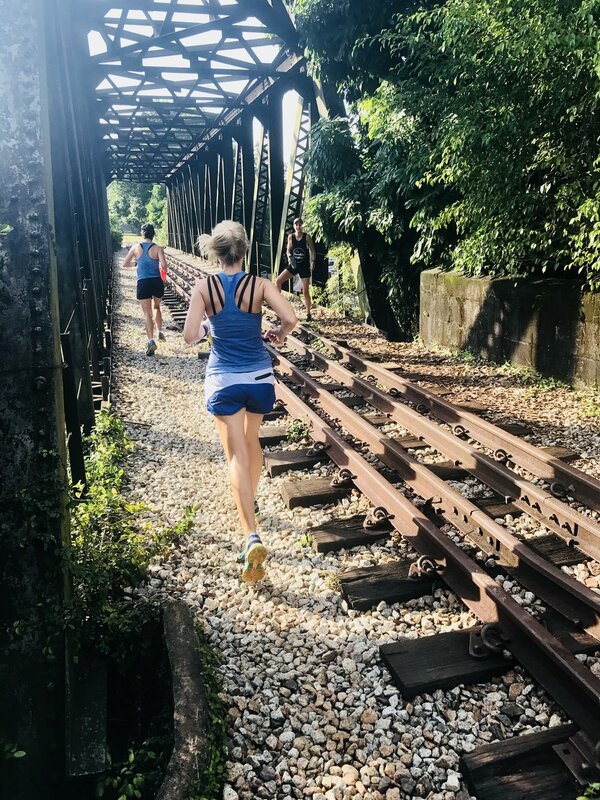 travelling bootcamps (or runcamps as we call them) across some of Singapore’s most beautiful spots. This is an old favourite as there are so many routes to choose from here and so much variety in one place. If you want flat, you’ve got it, if it’s a hill training day, you’ve got that too. I also really love just doing timed loops around the two lakes. Plus, it is just so beautiful in there you can’t help appreciate the beauty which makes me happy. To top it all off, they keep building new parts, and so it feels like there is always something new to explore. I never get tired of running in the Botanical Gardens. A lovely shady running route. The hills and trails add that extra challenge, plus when the light catches the trees early in the morning, its breath-takingly beautiful. You’ll see some serious runners out here, plus many recreational ones too. You may also spot a fair few species of wildlife too. Although a lot of it is still closed for construction, this is one of my go to routes. It’s flat, it’s shaded and I really feel like I am getting away from it all when I run here. The bonus (if you run the route in the direction of the Rail Mall) is you pass by, and connect to, other running routes so if you fancy a change whilst you are on your run, you can mix it up. Probably the most challenging running route that I do. The steps of Kent Ridge are a killer, but the city and sea views along the way are great. It’s always guaranteed to get my heart rate up nice and high and help me with my anaerobic training! Sometimes it is just nice to zone out on a flat route, and that’s why I love East Coast. I usually set off from the Marina Barrage so the runs starts off with the beauty of Singapore’s skyline. You can run for (nearly) as far as you wish so you are not tied to a set distance, if you feel good, you can go for longer. Plus, there is something so beautiful about running alongside the water and the sea breeze helps negate the humid Singapore climate. And there you have it, Gemma has spoken ;) Do you have a favourite route? Why not join us for our next running class or bootcamp? Sign up for a free trial HERE.